PREVIOUSLY: The previous three Le Carré film adaptations came out in a clutch, within four years of each other. Then the paradigm shifted, and adaptations moved to television. Perhaps the most famous and well-regarded Le Carré adaptations are still the Guinness Smiley series, the first of which was released a full decade after The Looking Glass War. CURRENTLY: Five years after that, we come to the eighties, and the Israeli-Palestinian crisis. The first thing that happens is that Dana Wheeler-Nicholson, a year before being romanced by Chevy Chase in Fletch, makes her apparent film debut by blowing up the residence of an Israeli ambassador with glee and with complete lack of concern about executing the small child who lives there. We later meet the leader of a Palestinian training camp who decries such sangfroid, and such actions, but such denunciations don’t prevent him from continuing to use them as tools for the greater end. Similarly, we have Diane Keaton, an American performer with a theatre company in Nottingham, recruited by Israeli intelligence because they believe her faith in the righteousness of a Palestinian state along with her skills as actress will allow her to convincingly pose as a terrorist recruiter’s girlfriend. Viewed from a current perspective, there’s a dalliance with the idea of radicalization of Westerners that could either give a viewer pause or reassure us that our current fear of Arabic fifth columnists in our backyard is not particularly new. But it’s not the ultimate focus of the material, which is more interested in trauma and dehumanization. 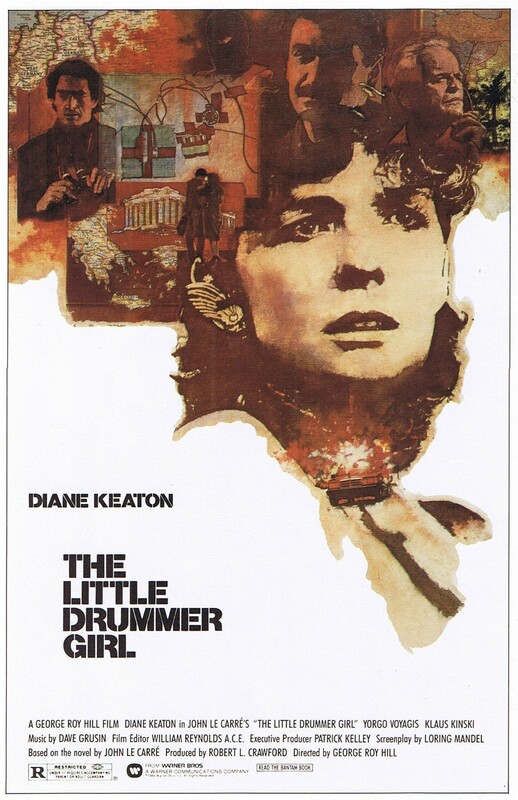 In fact, Drummer Girl stakes out both moral and exploitative territory that Spielberg will eventually cover in Munich almost twenty years later. The material and its presentation try to be even-handed. The best representation of this is a scene between Keaton’s character of Charlie and Yorgo Voyagis’ Israeli agent, who she calls “Joseph”. The Israelis have captured a terrorist with whom they want Charlie to pretend to have had a brief, intense romantic relationship. They can fabricate evidence of the affair, but they also want Charlie’s testimony to stand up to scrutiny. So they are leading her through experiences so that she can recall the sense memory of the places and conversations as an actress, and believably recount them under questioning. “Joseph” is performing as the stand-in for Michel, the captured man, but Charlie can’t commit to the “reality” of this false-front romance, and wants to flirt with Joseph. Joseph tells the story of Michel’s father and grandfather facing down the Israeli tanks that reclaimed territory by force. He tells it convincingly, with fervor and belief in the Palestinian perspective, as Michel would have. Charlie looks at him doubtfully, knowing this is not his story. She asks where he was during these events, and Joseph reveals he was in the tanks that drove out and killed Michel’s family and those like him. The cognitive dissonance of listening to a man tell — convincingly, empathetically — the story of his enemy is an extraordinary technique for making the audience weigh both sides and come out with no clear answer. The methods of the Israelis are brutal, but they are deployed against equally inhumane practices. Everyone acts from a position of righteous justification, and everyone still emerges tainted. The exception being Charlie. Spoilers after the cut. She is accused of believing in nothing moments before being spattered with the lifeblood of the man who had just said so. A man who had induced her to kill others, and a man she had just slept with. A man she had pretended to agree with, after having been convinced he was the enemy, after having previously believed his actions were justified. Charlie, early in her courtship of “Joseph”, says that she may not be a real person, that instead she is “bits of people, like [her] mother’s rag-bag.” We are given this to weigh alongside statements about her desire for political theatre without actual political action. All of this seems to explain her ability to switch sides with such fluidity. As she arrives at the Palestinian training camp, we hear her singing Tony Hatch’s “Downtown”, the same song she belted out as she was driving a car packed with plastique. We smile with recognition of the song and of the earlier scene. This is a charming moment of game, cavalier spirit on Charlie’s part, but it also underscores that she has no real idea the seriousness of what she’s doing. She may survive the story, but she was used as surely and as destructively the plastique she transported. Keaton does a great job of playing a woman who is acting with various degrees of veracity and conviction. She is able to perform with utter finess someone who isn’t quite convincing in her performance. And she’s also able to portray a woman who is out of her depth with either glossy ignorance and glass-eyed dismay, as the moment demands. Contemporary reviews disagree with me, finding that there wasn’t enough complexity to Charlie’s character. The New York Times couldn’t help but wish that the sprawling novel had been given the TV miniseries treatment, which seems like less a review of the film itself than of the accepted context for Le Carré adaptations with which we started this column. Roger Ebert similarly could only review the film in comparison to the novel, bemoaning the alterations to the main character and the complexities edited out for brevity’s sake. I take his point that Keaton, 36 years of age at the film’s release, slightly strains credulity as a wide-eyed novice, naïve in the ways of politics and realpolitik. But I would counter that for her to do the actorly duties of playing a woman playing parts, of being believably on the edge of lacking believability, requires skill that perhaps would be beyond the ability of a less seasoned craftsperson. However, the leaden critical response seems to have played its part in muting reception and reputation of the film. Available only through Warner Brothers’ print-on-demand DVD service, there is little clamor to reclaim this film as a worthy artifact of past politics or touchstone performance. Which I think is a pity. I have no doubt the film is a reduction of the novel — I can’t be certain, having not read it, but I wouldn’t be at all surprised — but I think the film fits well within the context of political thriller history on film, and in the scope of Le Carré adaptations in particular. First of all, the lecturer providing Michel with his opportunity to present his pro-Palestinian viewpoint is played by Anna Massey, who appeared as Anthony Hopkins’ wife in Looking Glass fifteen years prior. Secondly, John le Carré shows up in the film, appearing in the credits under his name of David Cornwell instead of the established nom de cube. He will go on to cameo in precious few other film versions of his work, and while I would hesitate to interpret his presence as comment on the success of the adaptation, it does mark it firmly as important in the great Le Carré chain. Additionally, the film was shot on location in England and Germany and Greece and in the Israeli-occupied West Bank, which gives it the travelogue quality that will be not only the hallmark of next week’s Russia House, but is also part and parcel of the remit of the espionage film. Bond films are notorious for providing this kind of spectacle, switching between a catalogue of jaw-dropping locations over the course of the story, and while this was at least partially done in early days because it showcased vistas tourists would not have visited themselves, it also helped sell the scope and import of the story. Drummer Girl isn’t interested in that kind of breathtaking scenery, but instead in verisimilitude. It presages Tom Clancy, using the undeniable reality of locations to underscore realistic violence and international stakes. The echo of Clancy is an unfortunate one, however. It takes about forty minutes for the first subtle conflicts of character motivation to appear in Joseph, for allusions to his deeper conflicts about his actions to finally make the film start to feel less like a prequel to The Sum of All Fears and more like a Le Carré story about people instead of clockworks. And lastly, I enjoyed the business of the business of theatrics. I was intrigued in Deadly Affair by how much time was spent on showing us the mechanics of the production of Macbeth. It didn’t seem to affect the forward motion of the story, but there we were, watching the particulars of dry ice in cauldrons and the vanity of an old man playing one of the witches. It would have been simple to minimize this, to have it in the background as Inspector Mendel interviewed the virgin theatrical dogsbody who had observed Mrs. Fennan attend the theatre. Simpler still to have not staged it at all, but to move the interview to the lobby or backstage. So including it was intentional, and the comment on the action of acting and artifice equally so. The penultimate action in Affair has the realization of Frau Fennan and Deiter Frey play out in parallel to the production of Edward II, with Shakespeare’s lines providing us with insight into the inner workings of the murderer and accomplice. Similarly, it’s interesting in Drummer Girl to see Keaton’s character playing Shaw’s St. Joan and Shakespeare’s Rosalind and to wonder what aspects of martyrdom and disguise either Le Carré or director George Roy Hill wanted echoed. I will need to keep looking for allusion and theatricality in Le Carré and see if it’s an accumulative trope. NEXT: A roundtable gathering of character actors, British and American, lounge anxiously in rooms and listen to audiotapes of Sean Connery pitching woo to a woman half his age. Shot on location! + The New York Times interviews Le Carré about the alterations and politics of Drummer Girl. Of particular interest when weighed against the critical response, which seemed to find all of the balanced judgements expressed here for naught. + The Night Manager has wrapped up, and Vulture lists some of it’s changes from the source material. + Cover gallery of various editions of Le Carré novels. I’ve stared and stared at the Pan paperback edition of Little Drummer Girl and I can’t figure out why the two Ms are hanging in a little separate sign. It clearly means something that eludes me.